Tomas Transtr mer - the recipient of the 2011 Nobel Prize in Literature - can be clearly recognized not just as Sweden's most important poet, but as a writer of international stature whose work speaks to us now with undiminished clarity and resonance. Long celebrated as a master ... read full description below. 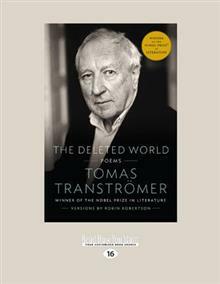 Tomas Transtr mer - the recipient of the 2011 Nobel Prize in Literature - can be clearly recognized not just as Sweden's most important poet, but as a writer of international stature whose work speaks to us now with undiminished clarity and resonance. Long celebrated as a master of the arresting, suggestive image, Transtr mer is a poet of the liminal: his verse is drawn again and again to thresholds of light and of water, the boundaries between man and nature, wakefulness and dream. A deeply spiritual but secular writer, his skepticism about humanity is continually challenged by the implacable renewing power of the natural world. His poems are epiphanies rooted in experience: spare, luminous meditations that his extraordinary images split open - exposing something sudden, mysterious, and unforgettable. Brilliantly translated by renowned Scottish poet Robin Robertson, the work collected in The Deleted World span the breadth of Transtr mer's career and provide a perfect introduction to the work of one of the world's greatest living poets.